This recipe for Haricots Verts (French Green Beans) with Tarragon and Orange is simple and uses only five ingredients. In less than thirty minutes time, you have a fragrant and crisp-tender side dish that is a perfect accompaniment to your dinner or holiday meal. To kick off the Thanksgiving recipes this year, I wanted to present an alternative to the green bean casserole. Haricots verts is just a fancy name for French Green Beans, but the dish itself doesn’t have to be fancy. For this recipe, you only need to lightly cook the haricots verts, then sauté them with some fresh zest and herbs to get that perfect autumnal flavor. It takes 30 minutes or less from start to finish, making it a perfect complement to your Thanksgiving or Holiday table. It’s easy to make, guests love it, and it doesn’t leave you feeling heavy at the end of the meal. Haricots verts (pronounced air-ee-koh-VER) are French Green Beans. They are a tenderer, younger green bean that is longer and thinner in shape that makes for an exquisite presentation for a meal that you want to elevate a bit beyond the ordinary. Don’t worry though, if you can’t find any, you can substitute with any fresh green beans that are in stock at your market. Keep in mind though, using other green beans may make your cooking time a little longer, so allot for that in your meal preparation. The main thing to know for the presentation of haricots verts is how to trim them. If you look closely at the photo, you’ll notice that one end of the green bean has been removed; this is the fancier version of snapping the ends with your grandma. You can do it one by one, or by the handful if you like. Although, trimming them individually produces less unnecessary waste. To trim haricots verts, the tapered end can be left on because they are tender enough to eat. Instead, you want to focus on removing the stem end by cutting just below it on a bias (aka: diagonally). Once you have removed the stem end, prepare them according to the recipe. For even better success with this recipe, I recommend brushing up on these culinary skills. How To Blanch and Shock. 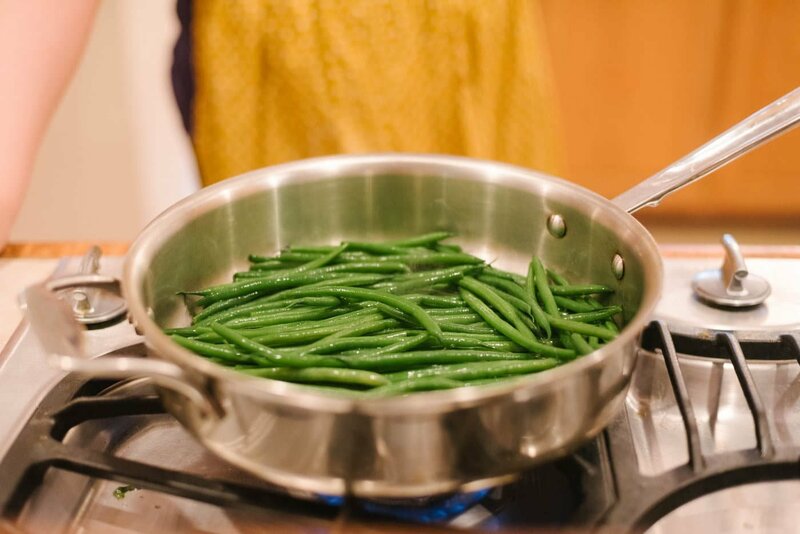 This haricots verts recipe uses blanching in boiling water and shocking in ice water as a way of preparing the green beans to the right texture, as well as locking in color. If you want to serve your guests the most beautiful, perfectly cooked green beans around, make sure to read this for my tips. Buying and Storing Fresh Herbs. Tarragon isn’t a commonly used herb, which means it can be expensive. Don’t let your money go to waste and find out what to look for when purchasing the tarragon and how to keep it fresh at home. Sautéing 101. This simple recipe is finished by sautéing, a cooking method that uses high heat and little fat. Brush up on how to control your temperature for success, and get a handy infographic to help you remember the steps. Buying and Storing Citrus. If you’re not completely sure what to look for when purchasing the best oranges, you’ll find that here. 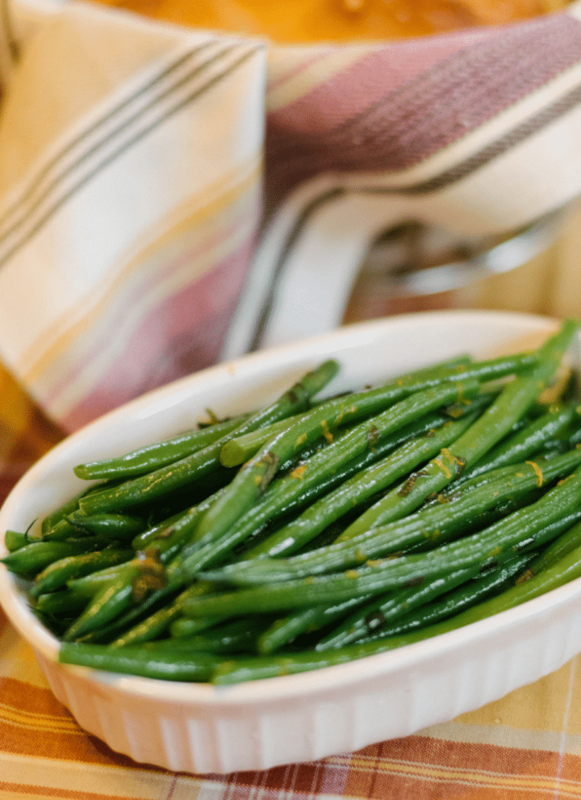 If you’re looking to serve this as a simple side dish to go with dinner tonight, I highly recommend popping over to my Main Dish section for ideas of what to serve with these green beans. If you’re looking for other delicious dishes for your Holiday meal, these are my most popular! These green beans are incredibly simple to make, and the way the orange and tarragon balance each other provides just the right amount of natural sweetness with the pungent and slightly bittersweet flavor of the tarragon. It’s a simple process that yields a very good side dish! Want a free printable grocery list for this Haricots Verts recipe? Get it HERE. This easy 30 minute or less recipe for haricots verts (French green beans) is a fragrant and crisp-tender side dish that complements any meal! Bring a large pot of salted water to a boil. Fill a large bowl halfway with ice and pour enough cold water over it to just cover the ice. Working in batches if necessary, drop in the green beans and cook them for 4 Minutes, or until they have turned bright green and are just beginning to cook. The blanching time may vary based on how thick or thin your green beans are. Strain or drain the beans from the water and quickly submerge them into the ice water. Let them chill until cooled. Remove them from the bowl and pat dry. In a sauté pan over medium-high heat, heat the olive oil. Add in the green beans and cook for 5 Minutes, or until the green beans are hot throughout and cooked, but still crisp-tender. Add in the orange zest and the minced tarragon and cook for 1 Minute. Season with salt and pepper, and serve.